Ground Sound was founded by three friends Henrik and Allan and me in 1986 and started out in the PRO stage. This involvement lead to building of various PRO loudspeakers, power amplifiers and analogue active crossovers. 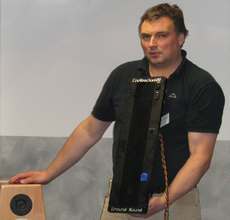 One of the bigger achievements was the horn and horn-reflex subwoofers for 18� PRO drivers designed by me which became quite famous in Denmark and still are. Some of the business has been distribution of loudspeakers parts, light equipment, Lab.Gruppen PRO amplifiers and later subcontractor for Lab.Gruppen. Over the years Ground Sound became a one man business, but Henrik and Allan still helps out with the economics and web, thanks guys. I have a great passion for music, electronics and Doing It Yourself. This combination and my background studying electronics at The Technical University of Denmark (DTU) is the reason for the products offered to you today. The new era of the company started in 2003 at my search for a decent digital crossover for my own HiFi � nothing really to be found. I decided that I was to develop a digital crossover for myself and a lot of energy was put into this project. All of the achievements like very low noise and distortion and user friendly software of these early filters ended up in the current digital crossover DCN23. The advantages of DCN23 has been accompanied by other technological advancements like the DCN28 and the even better software - the XOverWizard II. - yet very easy to use both at setup and at daily basis. Please notice: New registration number and new address of bank account!